Someone asked me the other day what exactly went on at the Chris Hani trial way back in 1993. His question was prompted by a renewed flurry of nonsense on the internet, and I thought why not, a review is well in order. In 1993, I was briefly arrested and then released without charge in connection with the assassination of Chris Hani, the leader of the South African Communist Party and chief of staff of Umkhonto we Sizwe, the armed wing of the African National Congress (ANC). I always chuckle when I read from the internet cranks that I was responsible for the arrest of Clive Derby-Lewis and Janus Walus, who were the planner and the gunman in that case. In reality, I was arrested after Clive Derby-Lewis gave my name to the police, not the other way round! “The South African police arrested five more right-wingers before dawn yesterday in connection with the assassination of the African National Congress (ANC) leader, Chris Hani, and confirmed widespread suspicions that he had been the victim of conspiracy. One of the five arrested yesterday was Gaye Derby-Lewis, the Australian-born wife of Clive Derby-Lewis, the former far-right MP arrested on Saturday. The others were Arthur Kemp, Faan Venter, Lionel du Randt and Edwin Clark, all understood to have right-wing connections. Mr du Randt and Mr Clark were released after questioning. The police said yesterday they had achieved their 'breakthrough' in the Hani investigation on the basis of information provided by Mr Derby-Lewis.” (Source: Suspects held in Hani inquiry: Police confirm plot after five more arrests, The Independent, 22 April 1993). Funny that -- my name was given to the police by Clive Derby-Lewis, but now in the mad world of the internet bloggers, I am the one who “betrayed” Clive Derby-Lewis. You could not make it up, actually. According to the internet cranks, I was a “key state witness” in the trial which followed. Actually I was a minor witness and testified absolutely nothing about the murder at all. I was served with a subpoena to testify about the list of names and addresses I had given Gaye Derby-Lewis earlier that year – and that was all. The list was not even a “hit list” - - as the court also accepted. (Source: SA right-winger linked to UK BNP, News24.com, 9 May 2009). Gaye Derby-Lewis testified at a later Truth and Reconciliation Commission hearing that she had “compiled the list.” (Source: TRUTH AND RECONCILIATION COMMISSION, AMNESTY HEARING, 1 December 1997). The actual “key witnesses” in the trial were the two people who were eye witnesses to the shooting and the people who testified about the firearm and the silencer - - none of which had anything to do with me. These witnesses were Margarita Harmse, an Afrikaner woman, and Michael Buchanan, both of whom not only witnessed the shooting but also identified the shooter, Janus Walusz at an identification parade. (Source: Witnesses identify 'Hani killer' The Guardian, 31 March 2007). and Conservative Party member Keith Darroll, who testified that he had acquired and made the silencer which was attached to the murder weapon (Source: The assassination of Chris Hani Independent Online, 10 April 2008). There were in fact nearly 60 witnesses in the case, all of whom gave far more important and relevant to the actual shooting than I. Compared to that lot, my minor evidence about a list given to Gaye Derby-Lewis three months earlier was absolutely minor and in no way implicated Clive Derby-Lewis or Janus Walusz. Furthermore, the really crucial evidence in the Hani case was supplied by Walusz and Clive Derby-Lewis themselves, who fully confessed their actions to the police when they were first arrested under the Internal Security Act. (Source: Department of Justice Amnesty Transcript, Sapa, 17 August 1997). My evidence in court in fact never touched on Clive Derby-Lewis or Janus Walusz at all. The Truth and Reconciliation Commission hearing into the assassination of Chris Hani heard that the original trial court had heard “ that Mr Kemp was not regarded as a co-conspirator” (Source: TRUTH AND RECONCILIATION COMMISSION, AMNESTY HEARING, 1 December 1997). So What Did I Testify to in Court? (1) I testified that I and Mrs Derby-Lewis had had nothing to do with the Hani assassination and we had merely cooperated with her in preparation for an article which compared the lifestyles of ANC and leftist leaders with those of their followers. (Source: South African Court of Appeal, 1989 Court Records lines 20-21). (2) I confirmed to the court a previous statement ALREADY GIVEN by both Gaye and Clive Derby-Lewis that I had provided the names and addresses which had then been passed on to Mr Janus Walus, the man who had actually carried out the assassination and about whom I knew nothing. (Source: South African Court of Appeal, 1989 Court Records, 23-34). (3) When Mrs Derby-Lewis was acquitted, the presiding judge, JA Hoexter, made specific reference to the fact that the reason she had been found not guilty was because of my evidence in court. There is little doubt that had I not come to her aid, she would also have been found guilty and would also be sitting in prison today - as specifically stated by the judge. (Source: South African Court of Appeal, 1989 Court Records, lines 33-34). (4) As the court record clearly shows, I provided the court with no evidence which the Derby-Lewis couple had not already given to the police. In addition, I provided no evidence whatsoever in connection with either Mr Derby-Lewis’s or Mr Walus’ involvement, as I quite genuinely knew nothing about it at all. All this can be easily seen by simply reading the court record, and lines 24-26 in particular. (Source: South African Court of Appeal, 1989 Court Records, lines 24-26). As to the allegations about me being a “police agent” - - it is true that I served my national service in the uniformed branch of the SA Police. In fact, I helped Gaye Derby-Lewis canvass in the 1987 General Election when she stood in the Hillbrow constituency, while I was in the police! I "Fled" South Africa "Because I Testified in the Court Case"
Another lie first started by the SPLC was that I "fled" South Africa because I testified in the court case" out some some fear that the "right wingers" were angry with me. That SPLC lie was an attempt to smear me personally, but, sadly for that organization, it is a lie which falls down of its own accord. The Hani Trial was in 1993. I emigrated from South Africa to the UK in 2007 - - FOURTEEN (14) years later! Hardly the actions of someone "fleeing in fear".... the truth was that I simply didn't want to live under an ANC government, and exercised my right of ancestry in Europe to leave. But, like everything else the SPLC says, they never let facts get in the way of their agenda. 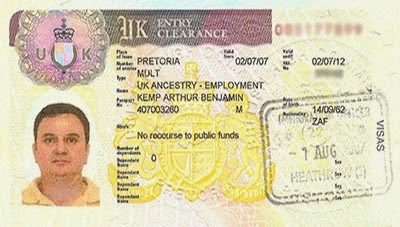 My UK Ancestry Visa, entrance, dated 2007. So how come you were seen at a BNP meeting in London in 2004? In 2004 I visited the UK for two months and I was invited to address a meeting in London. A Searchlight agent quite falsely reported that I was "running the London BNP" (a laughable allegation) and that lie was faithfully repeated in Searchlight's mouthpiece, the Guardian.